Curaçao is a small island North of the coast of Venezuela. The shore is mostly rocky but contains several bays and beaches. The reef drops off close to shore along the Southern shore. Along the Northern shore the drop-off is farther from shore but still reachable while swimming. This means that most dive sites are accessible from shore. The easiest entry is from a sandy beach; second best is the entry from a beach with coral rubble. More difficult is the entry from a rocky shore and most difficult is the entry where the top of the cliff is one or more meters above sea level (mostly along the North shore). The same applies to the exit after the dive. Because of the prevailing wind direction from the North-East the sea along the Southern shore is mostly calm. This in big contrast to the sea along the Northern shore where high waves can pound the cliffs. This makes diving at the Northern shore less attractive and even dangerous. Never dive along the Northern shore without sufficient experience and never without a dive guide who knows where it is save to dive and when the weather and sea conditions allow diving there. Along the Southern shore diving is mostly easy. A lot of the sandy beaches are home to a dive shop. There you can get information about diving at that location, about special attractions and you can rent tank, weights or a complete set. Always bring your certification card when you need rental equipment. Most dive shops also offer guided dives. Some also offer boat dives; that comes at an extra cost, but some diving sites are easier to dive from a boat than from shore and there are also diving sites where a boat dive is the only option. And there are divers that prefer the comfort of diving from a boat. To find your way around the island a map and a car is a necessity. A good map for divers is the Dive and Drive map that is available at the book stores and some dive shops. 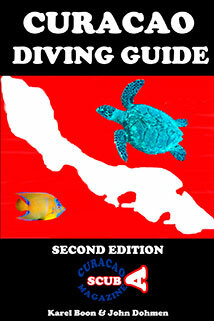 When you want more information about diving sites consider buying the Curaçao Diving Guide. It contains descriptions of 100 dive sites in Curaçao along the Southern and the Northern shore, moslty shore dive sites, but also boat dive sites. The guide is available at several dive shops and at the bookstores. Unfortunately the diving guide is only for sale in Curaçao. To get in the mood for diving and for planning purposes before your reach Curaçao information and pictures of several dive sites are available on this website. If you need more information feel free to send me a mail through the contact page. I am not associated with any dive operator on the island; information is free and only biased by my 20 years of diving experience on this island. Most importantly: enjoy your vacation in Curaçao and enjoy the beautiful underwater world that Curaçao has to offer. The first article focusses on beginning photographers, the second and third on more experienced photographers and deals with advanced postprocessing.